The Nordstrom family group’s quest to take the Seattle retailer private was brusquely rejected this past week by the company’s independent directors, citing the “inadequate” proposed price, but another chapter in the saga may come soon. So what’s next? One person familiar with the deal thinks a resolution, one way or the other, could come soon. June 8, 2017: A group of Nordstrom family members, including the company’s senior leadership, announce their interest in taking the retailer private. The family group owns 31.2 percent of the company at the time of the announcement. Nordstrom’s stock, which closed at $40.48 before the announcement, gains 10 percent on the news. October 16: The family group suspends its take-private efforts for the remainder of the year to focus on the key holiday-sales period. The family later says uncertainty going into the holidays complicated efforts to secure debt financing. Share price declines to $40.40. March 1, 2018: Nordstrom reports strong quarterly sales and executives describe a “turning point” in 2018 toward wider profit margins. Shares climb to a close of $53.04, nearly the highest level in the last year. March 9: Nordstrom shares closed on Friday at $49.99, a penny below the price suggested Monday. The ball is in the Nordstrom family’s court. Beneath the stilted legalese of securities filings and news releases is the story of a notoriously private family trying to build on its legacy amid a rapidly transforming industry that is pulling competitors under. Whether public or private, that’s no easy task. As in any transaction, all sides want to get the best deal — indeed the board members have a fiduciary obligation to do so. With Nordstrom family members acting simultaneously as managers, company directors, owners and would-be acquirers, the scenario is rife with potential conflicts of interest. Observers say the company and family appear to have held them at bay, though even arms-length corporate transactions can face legal challenges on price from unhappy shareholders. Now Nordstrom the company awaits the next move from the Nordstrom family. The luxury retailer’s story is in many ways Seattle’s story. Returning from the Klondike Gold Rush, co-founders Carl F. Wallin, a shoemaker, and Swedish immigrant John W. Nordstrom, set up a 20-foot storefront on Fourth Avenue and Pike Street. The business expanded through a series of moves as the older buildings it occupied were torn down and redeveloped to accommodate a growing city. Wallin sold out his shares in 1929. John W. passed his stake on to his three sons. The initials of the paterfamilias, JWN, form the ticker symbol of the Nordstrom stock his descendants now want to buy back from the public. The company has been publicly traded since 1971. Four successive generations of Nordstroms have run the business. The top leaders today are co-presidents and brothers Blake W., Peter E., and Erik B. Nordstrom, all of whom serve on the company’s 12-member board of directors — though not on the committee evaluating a take-private deal. 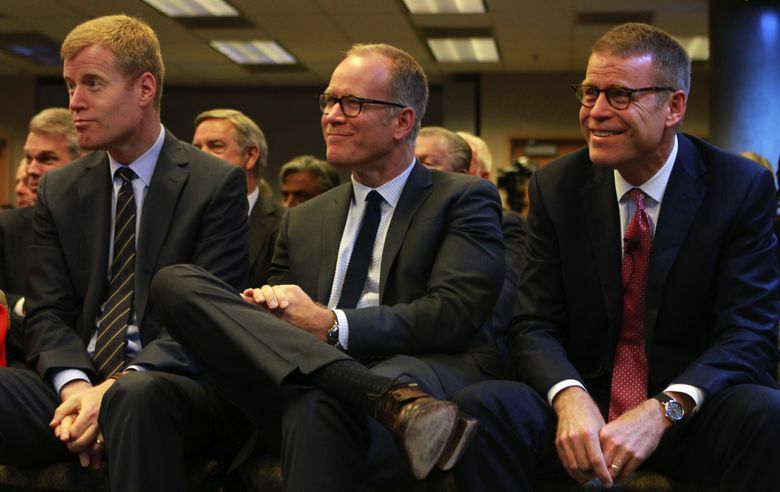 The brothers, along with president of stores James F. Nordstrom, John W.’s granddaughter Anne E. Gittinger and grandson chairman emeritus Bruce A. Nordstrom, form the group seeking to make Nordstrom a family-owned business again. To do so, they would need to buy the 68.7 percent of Nordstrom shares they don’t already own. At Friday’s closing price of $49.99 that portion of the company is valued at $5.73 billion. The Nordstrom family group has enlisted a private equity investor, Leonard Green & Partners, willing to contribute between $1.5 billion and $2 billion, and has received proposals for as much as $7.5 billion in debt from major lenders. This would-be business deal, not surprisingly, is deeply personal to the Nordstrom family. If the Nordstroms come back with a higher offer, it will again be evaluated by the company’s nine independent directors. The Nordstrom family, in presenting its anticipated offer price — subject to financing — noted that it represents a 24 percent premium to Nordstrom’s $40.48 share price on June 7, 2017, the day before they made their take-private effort known. But some observers suggest that’s the wrong baseline. That the independent members of Nordstrom’s board are holding out for more from the family suggests their optimism that Nordstrom is finding its online footing after years of investing in digital sales channels to complement its high-touch department stores. The family is also clearly optimistic — though the price they’re willing to pay will signal just how confident they feel in the changes they’ve made at the retailer. In this new world of retail, the Nordstrom family wants more freedom to manage and invest in the company without the short-term demands of quarterly financial reports and Wall Street expectations. That said, even as a public company, Nordstrom has been steadily improving its online offerings through technology developed in house, and acquisitions large and small. In the latter category, Nordstrom on Thursday said it acquired two Seattle startup companies — BevyUp and Message Yes — which bring technologies, and 30 new employees, to improve personalization and recommendations within the company’s digital sales channels. While being public may have its drawbacks, taking on billions of dollars in debt, secured by the business you love, also has downsides. The burden of debt payments can hem in operations. Recent tax cut legislation also reduced the amount of interest payments that companies can deduct from their profits, said Ron Friedman, partner and co-leader of the consumer and retail group at corporate accounting and advisory firm Marcum. “Now you’ve got to start making a lot of money to be able to deduct it all,” he said. “Anyone who ever wanted to look at [making a bid for] Nordstrom is thinking about it now because the company can’t say we would never consider it, because they’re considering it,” Kestenbaum said. While this scenario is a longshot, it underscores the conflicts of interest inherent in the contemplated deal. Anabtawi said both the Nordstrom family and the board of directors appear to be proceeding according to best practices. The Nordstrom family is not represented on the special committee evaluating the deal, which has its own independent legal and financial advisers. But what about in the case of a third-party buyer? Kestenbaum said there’s probably not a lot of would-be bidders. Friedman said he too thinks a third-party bid is unlikely, but not out of the question. “It would never surprise me because Nordstrom still is a good store,” he said. The Nordstrom family would be a formidable obstacle. They own a 31.3 percent stake and have said they wish to either buy the company themselves or keep it public. “We continue to have no interest in a disposition or sale of our holdings in Nordstrom, nor is it our intention, in our capacity as shareholders, to vote in favor of any alternative sale,” the family group said in a letter to the board. A third-party bidder who sought to buy Nordstrom out from under the Nordstroms also risks losing the family’s knowledge and feel for the business, Friedman said. “It’s hard to replace them if they walk away,” he said. If a third-party deal materialized and the special committee deemed it to be in the best interests of shareholders, the Nordstrom family would be in “a very tough spot … to act against those interests,” Kestenbaum said. However, if it came to a shareholder vote to approve an alternative transaction, Anabtawi, of UCLA, said, the Nordstrom family is entitled to vote their own shares in their own interest. For 117 years, that interest has been in running a retailer.